Posted on January 30, 2015 by Sabrina C.
People like to set goals for themselves during the new year: New Year’s Resolutions. Because of my love for reading, I am proud to say that I completed my reading goal of 50 books last year. With that amount, I finished some amazing series and books. This is my list of Top Three Reads read in 2014. This book is the sequel to another I reviewed a while back, Unbreakable. That book is still my favorite out of all the ones I’ve read. I love the supernatural mystery of it. I was in love with it so much that I had to countdown the days to when this book came out. The story begins with Kennedy at her new boarding school, where she was put after the police found and interrogated her that night in the rain. She’s on her own now. The Legion left to work. Their job has just begun, with Andras now free. But Andras has a mission too. He’s looking for Kennedy. 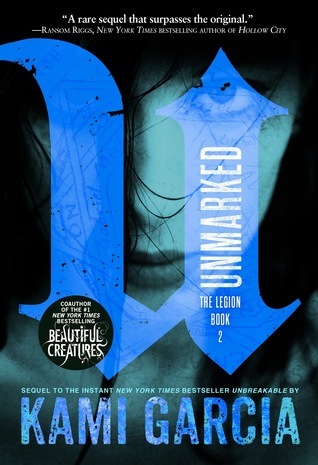 She has to reunite with the Legion in order to capture Andras and finally get her mark. In my opinion, Unbreakable had a better story. There was more action and different spirit encounters, as where in Unmarked it was just Andras. It wasn’t as exciting as I had hoped it would be. The ending wasn’t satisfying, either. I didn’t like it compared to the first one, but I still anticipate the third book in the series. Many of you know, Blood of Olympus came out in the fall, so I got to finish this exciting series, but I was also sad that it finally ended. It starts off with the continuation of the seven demigods’ quest to deliver the Athena Parthenos to Camp Half-Blood as a peace offering to stop the war against the Romans and the Greeks. They already have enough to worry about with Gaea, the earth goddess, on her way to the wreak havoc on the world. It’s time to end this intriguing series we all love. For those who have finished this book, let’s reflect. I didn’t like the fact that Percy and Annabeth barely spoke throughout the whole book. They’re the main characters after all. Also, I wasn’t happy with the end of the book (and not just because of the fact that it ended). Gaea is supposed to be the all mighty, most powerful goddess, so I expected a full on fight with her that would maybe take up an entire chapter or two, not a fight that didn’t even last a chapter. The way she finally died was very simple and didn’t seem to take up much effort from the demigods. Another thing was how the demigods finally ended up. I’m happy for Percy and Annabeth, getting the ending they truly deserve, and Nico, meeting someone who loves him back, and Leo for keeping his promise and finding Calypso. It would’ve been nice to see exactly what happened like an Epilogue to show how they lived. I know the rest is for the readers to imagine, but that’s my opinion. Overall, the book was okay. I’m still upset, though, that one of my favorite series ended. A couple of my friends have been telling me to read this book forever, and I kept putting it off, but when I finally did get to it, I couldn’t put it down. The story is set in the ’60s about Greasers and Socs. Greasers are considered the “low lives” in the neighborhood. They are kids who are usually not the brightest, form gangs, are poor, and distinguish themselves by styling their hair with grease. The Socs are the white boys who are rich and educated and love to beat up Greasers just for fun. The narrator, Ponyboy, shares the story of his life as a Greaser with his two brothers, Darry and Sodapop. Ponyboy is the youngest of the brothers, only 14, but he has seen more danger and destruction than one should see at his age. And of course, Johnny, Ponyboy’s best friend, who wouldn’t hurt a fly, as people say. All is normal and well enough between the two groups, until one member of a group kills someone of the other side. This book was very interesting, showing a time when kids jumped others just to get a kick out of it, not even to steal. The book even describes a gang fight including maybe twenty members from each side, just to see who’s the best. I couldn’t believe the ending. It shocked me because it was so surprising I never saw it coming. It’s a great book, and I can see why it was my friends’ favorite. Have you ever made a New Year’s Resolution involving reading or writing? Have you accomplished them? Are you making one for 2015? I think they’re great ways to keep on track. And as for these three books, have you read them? If not, are you now interested to? Posted on March 31, 2014 by Kate B. –The Outsiders by S.E. Hinton. 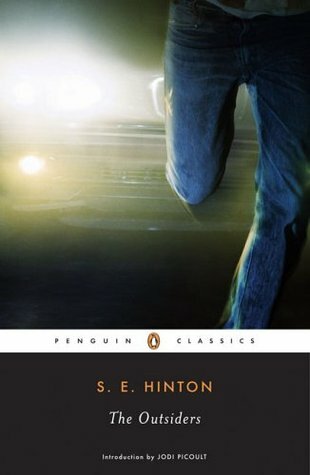 This book is about a fourteen-year-old Ponyboy Curtis and his life since he “stepped out of the movie theater with two things on his minds, Paul Newman and a ride home.” He lives on the east side of the town Tulsa, Oklahoma, where the Greasers live, with his two brothers Darry (Darrel) and Sodapop Curtis. On the west side of town was where the Socs (pronounced so-shiz) lived. Greasers are like street punks. They wear t-shirts, jeans, leather jackets, and boots or Converse Chuck Taylor All-Stars. They listen to Rock n’ Roll singers like Elvis Presley. They love hot rod cars and put grease in their hair to look cool. Each Greaser is in a gang. Ponyboy is in a gang with his brothers, Dally (Dallas) Winston, Two-Bit (Keith) Matthews, Johnny Cade, and Steve Randle. Socs, short for Socials, are the rich kids in town. They wear Madras shirts and have Mustangs for cars. They like to yell “GREASER!” when they drive by a Greaser and also jump (attack) Greasers. The main Socs in this book are Cherry (Sherri) Valence, Marcia, Bob (Robert) Sheldon, Randy Adderson, and David. I feel like this book is more for 8th grade in my opinion because of the violence. This book is also a movie and a old TV show!